Our guiding light is the ever-shining, never-setting sun of the Divine Grace. Ever the same constant as the northern star and bright as the mid-day sun, our Guiding Light is the Divine Grace of Shri Guru Deva Maha Yogiraj Swami Brahmananda Saraswati Maharaj, the most illustrious in the galaxy of the Jagad Guru Shankaracharyas. Our Guiding Light is the celestial Light of "The Supreme"1, the heatless, smokeless light of the Divine Effulgence, of "Vedanta Incarnate"2 the pure, serene, ever-guiding light of "the embodiment of Sanathana Dharma"3. Our Guiding Light is the light of perfection which emanated from the "Personified Divinity" and permeated the atmosphere of earth and heaven, to keep the path lighted for all times, to guide man to the Gods in heaven and the Gods to men on earth to elevate them. Our Guiding Light is the Universal loving benevolence of "Manifested Godhood" whose 'darshan' was the one solution to the miseries in life, and now whose rememberance is the one cure for all ills and sufferings in life4 . 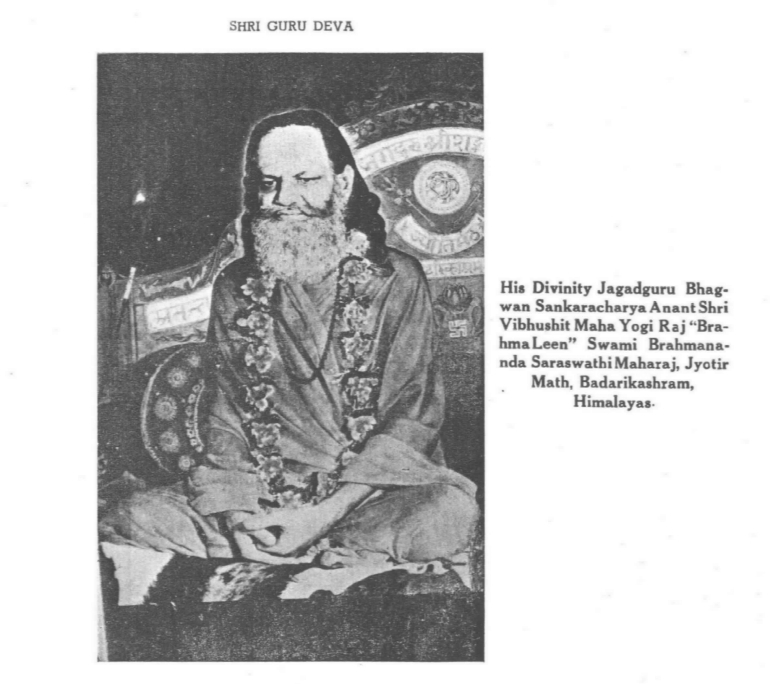 1 Justice Paul of international fame described Shri Guru Deva as 'The Supreme' in his presidential address at the conference of the eminent philosophers of the world during the Silver Jubilee Celebrations of the Institute of Indian Philosophers held at Calcutta in December 1950. 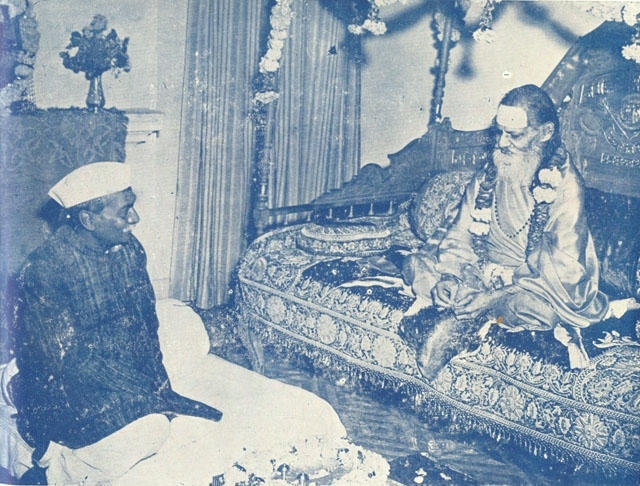 2 In the same conference Dr. S. Radhakrishnan addressed Shri Guru Deva as " Vedanta Incarnate"
3 Describing the personality of Guru Deva, the great Sanskrit Poet of the Aryavartha Santhana Dharma Maha Mandal, Kanpur, wrote in his poem "muurtiNmaana eshha dharmaH "Murtiman eish dharmah" i.e. He is Dharma Embodiment. 4 Another famous Sanskrit Poet of Benares, 'Ashu Kavi' Pt. Veni Madava Sastri 'Shashtrartha Maharathi' wrote in his prayer to Guru Deva - brahmaananda sarasvatiN guruvaraN pratyaksha devaN bhaje . i.e. I bow down to Swami Brahmanand Saraswathi who is the Great Guru and 'Present God' or 'God in Person' or "Personified Divinity." He was the one novelty, who was divine grandeur "par excellence". His sitting posture, His standing pose, His style of lying down, His royal pace. His movements and His silence in samadhi; everything was an inspiration and joy to one and all who had the eye to see and good fortune to enjoy. When He sat; His sitting pose attracted and inspired the eyes that fell on Him and inspired the minds and hearts that came under the divine aura of His gracious presence. His sitting posture was the ememplary sitting pose of a perfect Yogi, and when He walked, oh! it was a sight which Royalties have enjoyed and Gods have cherished on earth. Such was the perfection of His Personality, every aspect of which was an inspiration for one and all. Words that fell from His lips surcharged the atmosphere with vibrations holy and divine. Every word that He spoke charmed the ear and captivated the heart. The charm of His voice surpassed the melody of music. Well disciplined music of the best musician of the world would not charm as much as His simple words charmed the child and the old alike. Whatever He spoke was heard and enjoyed with undivided attention by one and all. His moving lips were the one point of focus for a million eyes gathered to listen to His evening discourses. Spell bound sat the audience with captivated mind and heart in His presence. It was an atmosphere of all joy around him. It was Anandam vibrating around Brahmanandam - (The "Conditioned Brahmanandam" was as it were conditioned transcendental Brahmanandam). When His words thrilled the air with joy, the whole atmosphere was surcharged with delight as if waves were set up in the silent ocean of Omnipresent Anandam - The Immoveable was moved by "the Expression of the Inexpressible". It was the grandeur of the perfection of inner and outer personalities of Guru Deva that attracted the eyes and hearts of the elevated and learned pandits of Bharata and that tempted them to adorn their learning by finding a suitable expression for the inexpressible Divinity. An expression was found in the words "Ananta Shri Vibhushit" which means "beautified with ever-the-same immeasurable grandeur". This is an expression in Sanskrit Language which was used for the first time in the history of India, to synthesise his Greatness. In the English Language, his devotees felt that the expression "His Holiness" didnot adequately describe this personified Divine Effulgence; and so the new expression of "His Divinity" was used. With such unique adoration of newer and fuller grandeur, transcending the glories of the expressions of antiquity, was worshipped the holy name of Guru Deva, the living expression of Upanishadic Reality, the embodiment of the transcendental Divinity. He was Maha Yogiraj in the family of the Yogis of Indias and was held by the "Gnanies" as personified Brahmanandam, the living expression of - "Poornamadah Poornamidam"*. The divine radiance blooming forth from His shining personality revealed the truth of "Poornamidam" (this manifested Brahman is poorna) and His Sahaja-Samadhi brought home the truth of both - "Poornamadah" and "Poornamidam". It was the perfection of this great spiritual Master which innovated a religious and spiritual renaisance in northern India and where ever He travelled. * That unmanifested Brahman is perfect and This Manifested Brahman is (also) perfect. This Great Pride of India was "Rajaram" in his early days when he was the love of his great family and was cherished as the "rising sun" in the community of Mishra Brahmans of village Gana, near Ayodhya in Uttarpradesh. He was born on Margashirsh Shukla 10 Samvat 1928 (equivalent to December 1871) with a silver spoon in his mouth, but his hour of nativity claimed him for the recluse order and not for that of the secular. At the tender age of nine, when the other children of the world were mostly busy in playgrounds, he had matured in the idea of renunciation; and by continuous and deep thinking was convinced of the futility and evanescence of worldly pleasures. He realised so early that real and lasting happiness cannot be had without the realisation of the Divine. The joys and pleasures that are obtained from the phenomenal world are mere shadows and smudged images of the ideal happiness and bliss, that is not far from man but exists in his own heart, enveloped by the dark clouds of ignorance and illusion. When he was barely nine years old he left home, and went to the Himalayas in search of God, the Light that dispels the great darkness in the human mind, the darkness that stands between man and the inner Enlightenment. During the search for a perfect spiritual guide, he came across many masters and good beginners but none of them came up to the ideal that he had set for himself. 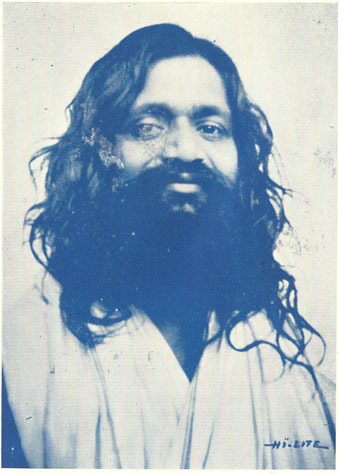 He desired his spiritual master to be not only well-versed in philosophic learning but also to be a person of realisation; and over and above these dual achievements he also wished his Master to be a life-celibate - perhaps the natural and legitimate desire of an aspirant who himself had decided to maintain that high ideal for life. In the world as it is constituted to-day, to find a personality combining these three conditions and attributes is difficult, if not altogether impossible, and so the young truth-seeker had to wander far and long before he arrived at the goal of his search. After about five years of wandering on the Himalayas, he reached the township of Uttar-Kashi. In that "valley of the saints", at that small and distant Himalayan hermitage there resided in those days a great spiritual master, Swami Krishnanand Saraswati Maharaj, a sage deeply versed in philosophical lore, representing a rare and perfect blend of theory and practice, of learning and realisation. To that realised soul, the young ascetic surrendered himself for being initiated into the mysterious realms of the spirit, whose real key-practices are attainable not from books and treatises, but only from perfect spiritual masters, who pass these top-secret practices from heart to heart. After sometime with the permission and order of his master he entered a cave at Uttar-Kashi with a resolve not to come out before he had realised the Light Supreme. His desire to attain the Highest knowledge was not merely an ideal wish or intention; it was a mighty, overpowering determination that burned like fire in his heart. It permeated every particle of his being and bade him not to rest or stop before the complete realisation of the Bliss Eternal. Soon he arrived at the Heatless, Smokeless Effulgent of the Self and realised the Divine Truth, the Ultimate Supreme Reality, Satchitanandam. The greatest attainment of a saint is his life itself, the high edifice of a realised Upanishadic living that developes under the stress of rigorous discipline and sincere truth-seeking. To understand that inner personality one must approach such realised souls with an open and receptive mind, and try to visualise the great internal life that is the basis of their actual and real form of living. At the age of 34 he was initiated into the order of Sanyas by his Master and then he again proceeded to Blessed Solitude, the only Blessedness. This time he did not go to the Himalayas but went to the Amarkantakas, the source of the holy river Narbada. For the greater part of his life he has lived in quiet lonely places, the habitats of lions and leopards, in hidden caves and thick forests where even the mid-day sun frets and fumes in vain to dispel the darkness that may be said to have a permanent abode in those solitary and distant regions of Vindhyagiris and Amarkanthas. He was out of sight of man but was well marked in the eyes of the destiny of the country. For more than one and a half centuries the light of Jyotirmath was extinct, and North India had no Dharmacharya to guide the religious and spiritual destiny of the people. Here was a bright light of spiritual glory well adorned by the perfect discipline of Sanatana Dharma; but it was hidden in the caves and valleys, in the thick forests and mountains of central India, as though the blessed solitude was giving a proper shape and polish to the personality which was to enlighten the religious and spiritual darkness that had overtaken the country, by the Flash of His mere presence. It took a long time, twenty years, to persuade him to come out of His loneliness and accept the holy throne of Shankaracharya of Jyotirmath in Badarkashramam. At the age of 72, in the year 1941, a well marked time in the political and religious history of India, He was installed as Shankaracharya of Jyotirmath, and that was a turning point in the destiny of the nation. The political freedom of the country dawned under His Divine Grace and He was worshipped by Dr. Rajendra Prasad, the first President of the Indian Union. His Policy of Dharma-prachar was all embracing. He inspired all alike and gave a lift to every body in his religious, virtuous, moral and spiritual life. He was never a leader of any one party. All parties found a common leader-head in Him. All the differences and dissensions of various castes, creeds and sampradayas dissolved in His presence and every party felt to be a thread in the warp and woof of society, and that all the threads make the cloth and that no thread can be taken out with advantage from it. Such was His Universality and all embracing nature. One unique principle of the Great sage that distinguished him completely from other living, saints, was that he did not accept money as a gift from his visitors or disciples. He was running the greatest religious institution of Northern India at his own expense, the sources of which were known only to himself. His entire personality exhaled always the serene perfume of spirituality. His face radiated that rare light which comprises love, authority serenity and self-assuredness; the state that comes only by righteous living and Divine realisation. His Darshan made the people feel as if some ancient Maharshi of Upanishadic fame had human form again and ……… that is worth-while leading a good life and to strive for the realisation of the Divine. His spiritual teachings are simple and clear and go straight home to your heart. He strictly adhered to the course of inner development laid down by the systems of Indian Philosophy and ethics and he raised his voice never in opposition but always in firm suport of the truths and principles contained in the Hindu Dharma. He stood at the pinnacle of human development and moved as only Jeeven-Muktas can move under the strong hold of "prarabdha". He for himself would allow things to go on as they are ordained by the hand of destiny, but His devotees have many a time changed the course of fate of themselves and of the people. Innunerable instances can be counted when by virtue of His Dhyanam, His devotees have wrought miracles worked in the innerman and transformed the materialistic hearts of iron into spiritual hearts of gold. As time would have it, after 12 years that flashed by, the Manifested merged with its original, the unmanifested, and "Brahma Leena Brahmanandam" is now appearing in the hearts of His devotees as waves of Brahmanandam. He cast off His mortal coil, but left behind a few others in mortal coil to keep burning the light of His grace and pass the torch of His teachings from hand to hand for all the millennium to come.